Affinity brings expert vector design to the iPad for the first time. Developed with input from some of the world’s leading designers, and based on Apple Design Award-winning technology, Affinity Designer is the most ambitious creative app developed for the iPad. For a limited period, it is on sale in the App Store with 30 per cent off. That means right now you can download a copy for just $13.99 / £13.99 / €14,99 (subject to local currency variations). To find out more, take a look at the launch video below. Developing Affinity Designer for iPad meant totally reimagining the way graphic design works on a screen. The team spent months working closely with leading artists, illustrators and designers to fine-tune the development of the app. The app has your entire workflow covered, from making initial sketches, to fleshing out a design in vector, to handing over the final design. To be truly useful, it’s vital the app can slot seamlessly into a professional workflow. With that in mind, Affinity Designer’s modern, powerful export engine covers all the major file types, whether a project is destined for print, online or another app. “Having the freedom to work from a sketch to a finished vectorised artwork all without any cables, in one app, is a dream come true and a huge time-saver,” comments illustrator and graphic designer Will Schorer. Velvet-smooth vector tools mean you can create curves with pinpoint precision. And in a real game-changer for vector drawing, pencil stabilisation allows you to produce the smoothest and most accurate lines possible drawing using freehand pencil and brush tools. What’s more, you can zoom in by over 100 million per cent, ensuring complete accuracy in your work. Affinity Designer for iPad comes with around 100 brushes built in, covering pretty much every requirement, and making it simple to add rich media texture to your designs. Naturally, Affinity Designer for iPad is optimised for the very latest iPad technology, including intuitive multi-touch gestures. The iPad’s advanced Metal graphics processing delivers unreal speed and lag-free real-time edits, even when working with the biggest files, while Apple Pencil dynamics like tilt, angle and pressure bring smoothness and stability to your curves and colours. Finally, the Drag and Drop feature that forms part of the iPad’s Files app enables you to bring projects in and out of Affinity Designer at a touch. The tool supports all major formats, 16-bit per channel editing, end-to-end CMYK, ICC colour management and spot colours for professional printing. 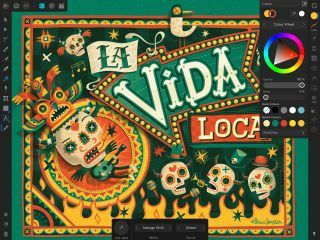 Boasting 22 non-destructive adjustment layers that preview instantly and can be edited any time, and with full support for masks, stacks and clipping layers, Affinity Designer for iPad offers the most advanced layer controls available in any vector-based app. Furthermore, its unrivalled text engine puts the power to create exquisite typography at your fingertips. Everything you need for end-to-end UI design workflow is on hand, including unlimited artboards, a powerful Symbols tool and full asset management. The app works seamlessly with the desktop version (sold separately), which won a coveted Apple Design Award in 2015. And it marks the second Serif app for the Apple tablet – image editor Affinity Photo is Apple’s reigning iPad App of the Year. Download Affinity Photo for iPad now to save a massive 30 per cent (usual price: $19.99/£19.99/21,99€). The same 30 per cent discount is also being applied across Affinity’s range of apps and official Workbooks.